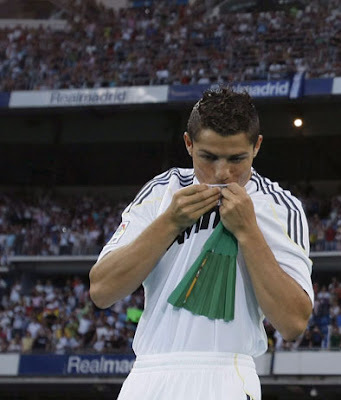 Cristiano Ronaldo is now familiar with the Santiago Bernabeu. The player arrived shortly after 14:00 and had a quick tour of the inner confines including a stop at the Presidential Balcony. After being given the green light at Sanitas La Moraleja Hospital, Cristiano Ronaldo was driven to the Santiago Bernabeu where he was welcomed by Jorge Valdano. The Director General and Presidential Aide gave the player a bried tour of the stadium and took several minutes to overlook his new pitch from the Presidential Balcony. The two later made their way to Puerta 57 restaurant, where Ronaldo could look out the window to see the sight of where he hopes to have many magical nights of football.